Quick and easy tomato tortellini soup recipe that’s ready in 30 minutes in 1 pot, using simple ingredients on stovetop. 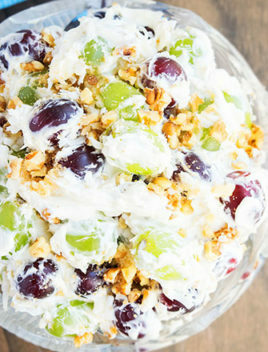 It’s rich and creamy and packed with so much cheese! Since it’s still so cold, there’s nothing I would rather do than to enjoy CREAMY tomato tortellini soup from scratch. This soup is rich, cheesy, smooth, creamy, filling and warms your heart as well as your stomach. It’s just as good as one of my other favorite meals: Cheese Tortellini with Garlic Butter Sauce (One Pot). 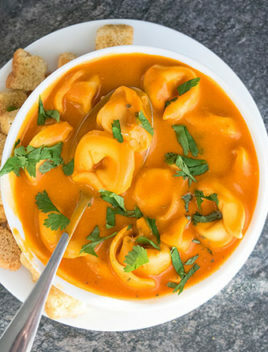 How to make tomato tortellini soup? Start off by heating oil and sauteing ginger, garlic and onions until golden brown. Add broth, herbs and spices, heavy cream, diced tomatoes, tomato sauce and cook for about 20 minutes. Add tortellini and cook until tender. 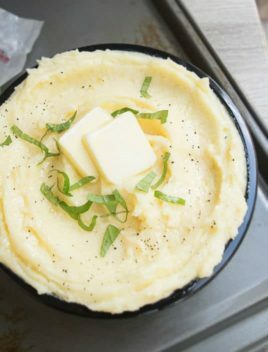 Stir in cream cheese and parmesan cheese. Garnish and enjoy! 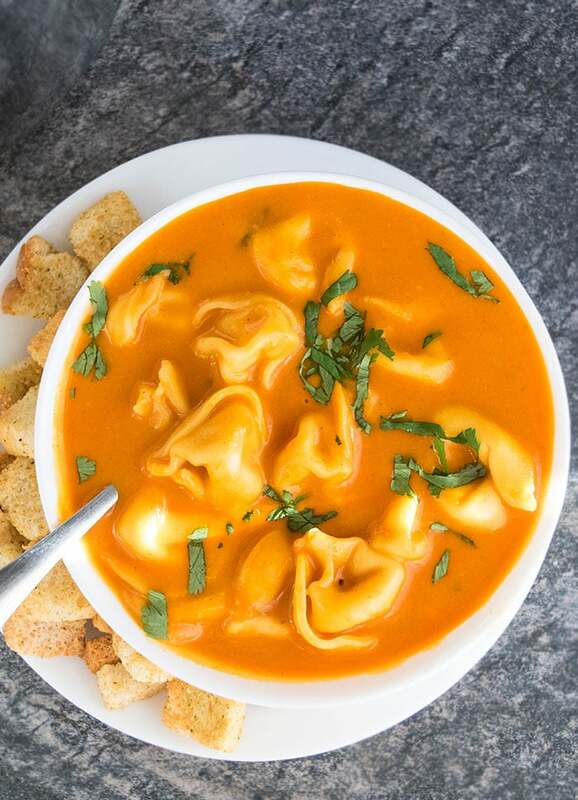 What to serve with tomato tortellini soup? Add 1 cup of sliced Italian sausage to make tomato tortellini soup with sausage. 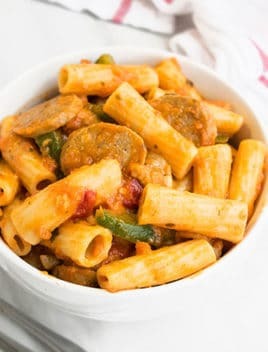 Cook the sausage separately and add it in the soup when you add the tortellini. 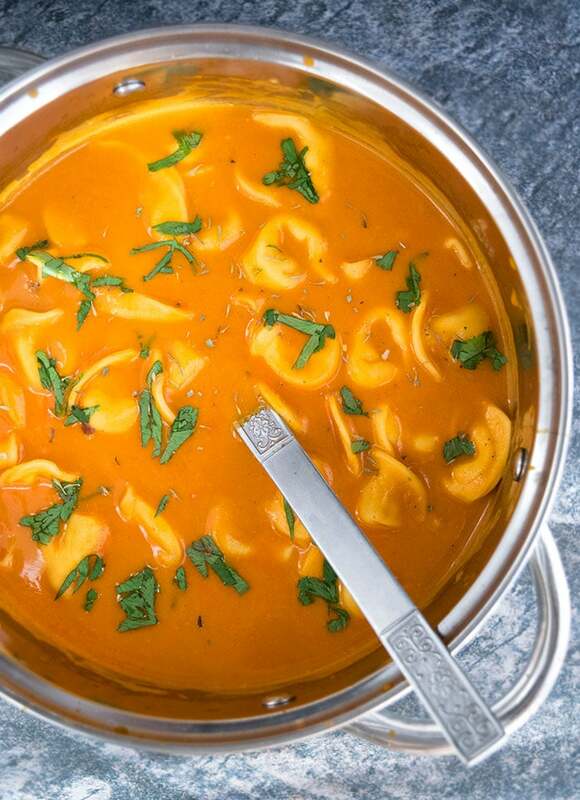 To make chicken tomato tortellini soup, add in 1 cup of cooked chicken cubes. Again, you will add the cooked chicken when you add the tortellini. For spinach tomato tortellini soup, add 1 cup of chopped spinach in the last 5-7 minutes of cooking. Add 1 cup chopped sun dried tomatoes in the soup to make sundried tomato tortellini soup. 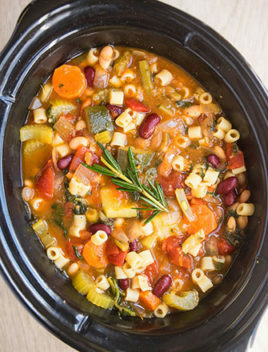 You can also mix in 1 cup of your favorite frozen vegetables to make a tasty vegetable tomato tortellini soup. 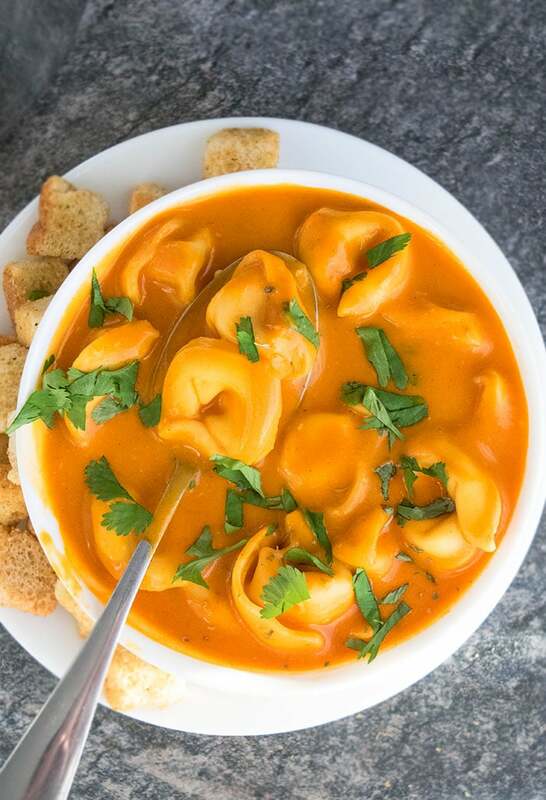 Basically, this is a tomato basil soup with cheese tortellini. You can enjoy it without tortellini too. You can use whatever broth you like. Both, chicken and vegetable taste really good. Make sure to use LOW SODIUM broth so that the soup doesn’t become too salty. REPLACE some heavy cream with Greek yogurt or milk and use low fat or fat free cheeses to make this soup a little HEALTHIER. If you are adding anything to the soup not listed in the recipe below (i.e. sausage, meatballs, spinach or other vegetables), make sure you cut and cook them properly SEPARATELY and then add them into the soup as one of the last steps when you add the tortellini. When you eat leftovers the next day, you may notice that the soup has gotten THICKER because a lot of the broth would have been absorbed by the tortellini. Just add a little more broth or water, while reheating to get the consistency you like. The amount of herbs in this recipe can be ADJUSTED, based on your preference. I will be sharing instant pot tomato tortellini soup and slow cooker or crockpot tomato tortellini soup versions soont oo. Quick and easy tomato tortellini soup that's ready in 30 minutes in 1 pot, using simple ingredients, on stovetop. It's rich and creamy and packed with so much cheese! Add diced tomatoes, tomato sauce, rosemary, oregano, basil, thyme salt, pepper, parika, chicken broth, heavy cream and mix to combine everything together. Cook for about 20 minutes on medium high heat. Add the tortellini and and cook until the tortellini is tender. Stir in cream cheese and parmesan cheese. Garnish with basil or cilantro. Enjoy! You can also omit all the seasonings and replace that with 1-2 tbsp Italian seasoning blend, based on your preference. Leftovers can be stored in a sealed container in the fridge for up to 2 days. I can taste this through the photo it looks amazing !! I bet the flavor is outstanding! Definitely a great dish to warm you up! What a great soup to pair with a grilled cheese! Looks so delicious and flavorful! Recipe developer. Photographer. Mommy & Foodie. 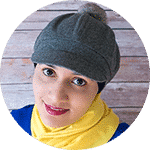 Welcome to OnePot Recipes, a place where I share my love for cooking using One Pot, Instant Pot and Stock Pot! © 2019 One Pot Recipes. Design by Purr.